The advocacy track hosted Kim Irwin from the Health By Design association on Nov. 29th to talk about Urban Planning. The general message of our meeting addressed the importance of sidewalks and adequate pedestrian options in Indianapolis and how they have gone about projecting and planning for these needs. It is an issue I find important in my personal life and for my medical professional life. I also get excited by the idea that the place I live can perpetually improve and that we can make it better and enjoy it as a community. So I was pleased to learn about and support the message of Health By Design which forms coalitions of stakeholders and groups that have more power and resources to change the City of Indianapolis for the better. When I moved to Indy I deliberately chose to live downtown near the Cultural Trail and the Monon Trail because I liked the walkability for outdoor exercising, historical sightseeing, access to a grocery store, and frequenting restaurants and shops all by foot. I was lucky to be able afford to rent in this up and coming area. As it turns out I’m not so unique, according to Ms. Irwin’s presentation my preferences are fairly typical of my demographic: educated, white, and on the older edge of the Millenial generation which has latched on to more minimalist, pedestrian, and community hub living styles than preceding generations. I get to choose where to live, how to get around with plenty of options available to me, and mainly decide to walk recreationally rather than for practical transport to and from work. However, the purpose of Health By Design is not for young yuppies who like to powerwalk to get their next latte (for the record, I do not power walk), it is also about equitable options for people who require public transit, public places, and pedestrianism for their way of life. Regardless of whether you use walking for recreation or necessity, having sidewalks that people can safely ambulate on enriches the lives of everyone. There are many areas of Indianapolis that walking as an easy and viable mode of transportation is hard. Arterial roads with high traffic and high speeds, long intervals between cross walks, lack of sidewalks, lack of pedestrian protection to cross at traffic lights, areas of greater crime, and general lack of lighting and visibility all contribute to walking being difficult or unsafe. Our heavily car reliant culture has not only changed our priorities in how cities plan transportation between areas of town but it also has influenced people’s perception of norms and socioeconomic class when it comes to getting around. Hopefully, social patterns will change over time to greater appreciate walking and exercise. In the Emergency Department I see improved walkability as affecting my patients two fold. First, sedentary lifestyles have harmed people chronically and second, a decent amount of trauma comes from pedestrians put in unsafe conditions whether they are assaulted by others, intoxicated, and/or because they are struck by vehicles. After a few shifts it is not a far stretch to understand how Indianapolis received the dubious title of “Least Healthy Metro City in the Country” in 2016 (http://www.theindychannel.com/news/local-news/indy-named-least-healthy-metro-city-in-the-country). While walking wasn’t directly measured in this study it is likely related: Indy Metro area came in below target for physical activity in 30 days, meeting CDC aerobic activity guidelines, aerobic strength guidelines, and below target numbers in parks and recreational centers, as well as the typical variables like rates of obesity, coronary vascular disease, diabetes, and death as well as others. However, addressing these issues from within the ED does not work. It takes a larger community to affect change outside the hospital. Kim presented the magnificent work that Health By Design has put into the initiative, Indy WalkWays, which is a collaborative partnership between Health by Design, the City of Indianapolis, the Marion County Public Health Department, the American Planning Association – Indiana Chapter and the Indiana Public Health Association. This initiative takes into account a number of factors to create an informed and improved Pedestrian Plan relevant to Indianapolis’ needs for greater walkability. It created a data driven algorithm and geographical information system (GIS) map to prioritize where Indianapolis should invest first for the biggest impact in improved walkability. This is necessary because unfortunately the need outstrips the funding. Right now, the cost of building an improved sidewalk network needed along Indianapolis’ arterial streets would be at least $750 million while the current annual budget is only $50 million for ALL city-funded transportation. 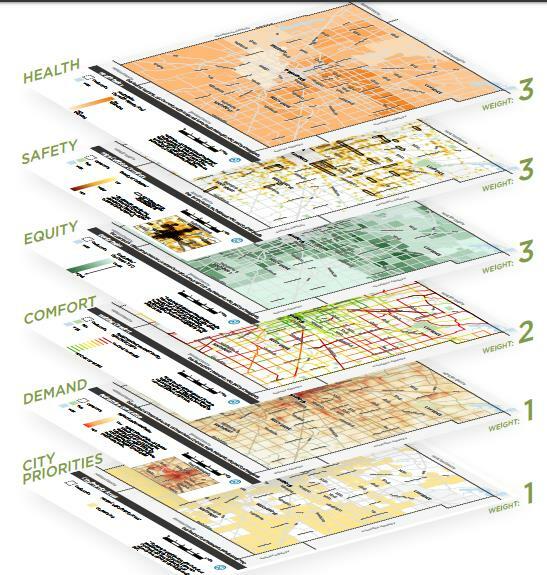 The scoring factors they used to weight GIS areas are Health, Safety, Equity, Comfort, Demand, and City Priorities. The image included at the end is the amalgamation of these maps came from their informative Pedestrian Plan available on their website (http://indywalkways.org/wp-content/uploads/2015/10/Indianapolis_Pedestrian-Plan_DRAFT_web_Pages.pdf). It is evident that their scoring system places heavier emphasis on safety, health, and equity for underserved communities which I appreciate. Ms. Irwin spent some time showing us each GIS layer individually which is also available in the Pedestrian Plan online. Health was notably worse in the near East-side of Indy extending to the eastern edge of the county. Access to grocery stores and parks was poor. Overweight, obesity, diabetes and heart disease rates were high. This area also suffered a density of pedestrian collisions. My own anecdotal observations have been that this is where some of our worst traumas like gunshot wounds come from. The equity GIS map illustrated the areas that are most dependent on city-funded transit for the majority of their trips, calculated from areas high in concentration of elderly, disabled, minorities, households without cars, limited English speaking, and poverty in a swath along the southeast and northwest. The safety GIS layer also showed more than 50% of pedestrian-vehicle collisions occurring in the heart of downtown which surprised me since this is the area I frequently run and bike. Ultimately, this comes together to form many high priority Tier 1 areas in downtown Indianapolis that would benefit from urban investment. A final piece of Kim Irwin’s presentation that I found interesting was the concept of not blaming the pedestrian for collisions that occur. This challenges our propensity in the medical field to point to a pedestrian’s choices to be irresponsible or drunk when they were injured so badly. According to WalkWays “No matter how you look at the data, every traffic fatality is preventable and unacceptable” because with proper planning and engineering human error can nearly be eliminated. For example, just reducing vehicle speed down from 40 mph by 10 or 20 mph in a collision with a pedestrian you improve mortality 50 and 90%, respectively. “Vision Zero” is a lofty goal to end all pedestrian fatalities adopted in other major metropolitan areas. The city of Indianapolis has not yet committed to this but WalkWays still advocates for city planning to keep safe non-motorized transportation in mind. The side effects of sedentariness and questionable life choices leading to trauma are problems that I cannot easily address quickly in a shift but I can remind myself based off of this talk how we can work to make things better in this city in the long run. I appreciated the chance to attend this talk and lift my head out of the Emergency Department fugue. It reminded me why I was excited to live in my new neighborhood when I moved here. I have absolutely taken advantage of the strides Indy has taken to improve its livability, which are the fruits of investments made years before I ever came here. It re-inspired the nerdy, community oriented, and policy driven part of myself (like Leslie Knope the fictional character in the TV show Parks and Rec). I hope I can participate in Indy WalkWays events that may happen this spring. I reflected on the fact that especially in the Emergency department where our empathy and patience is continually stretched, judgment and blame will sometimes creep into the background of my impression of patients and the societal issues they deal with are often complex and beyond their control. I could probably not walk a day in the shoes of many of my difficult patients’ lives so I’m thankful that an Indy group like Health By Design exists to make this walk easier.